Safety. It’s the driving force behind every aspect of the helicopter industry, a delicate bond uniting operators, suppliers, clients and end users together on so many critical levels. The collective efforts of all parties over the past number of years have worked to raise safety standards to new levels, as declining accident and incident numbers from various sources indicate. But how does one take responsibility for their personal safety footprint and apply it to real-world situations – and what about an operation’s role as a whole? What tools are necessary to bring things to a new level? Complex questions all and these were just some of the topics discussed during a lively roundtable discussion in the early morning hours of Nov. 15 during the Helicopter Association of Canada’s (HAC) annual conference and trade show in Vancouver. The invitation-only event brought together seven industry leaders from a variety of organizational backgrounds for an intriguing hour-long discussion. And while HAC president Fred Jones did his best to apologize for booking such an undesirable early-morning session – I am certain some members of the group were hurting from the rockin’ party the night before – once the caffeine kicked in and the group dug in, the discussion moved at a frenetic pace (that’s frenetic in the Canadian helicopter sense of the word). Here’s a synopsis of what the group had to say – and what potential safety solutions and questions remain. Helicopters: What role does safety play at your operation and how does it shape the overall culture? Fred Jones (FJ): It’s our role to help facilitate the development of safety standards in the industry. We do this through Best Practices, committee deliberations and facilitating those discussions. We also have a presence on the board of the International Helicopter Safety Team (IHST) and promote professional standards inside the Association, professional conduct among operators and promote it in our involvement in the regulatory development process. Corey Taylor (CT): People speak at safety seminars and admit safety has to start at the top; management has to buy in, your executives have to believe in it. But I don’t think this exists at a lot of companies. In our recurrent training, we go over safety issues all the time, yet it doesn’t seem to get communicated in the field. People will say, when they are being candid, that there are two sets of rules – those that get things done and keep clients happy and those that keep corporate types happy, with all the trappings of safety, structure, Safety Management Systems (SMS) etc. We are working hard to bring this gap together. Brad Fandrich (BF): We are a smaller operation, so safety with us is achieved in conjunction with our customers. Some are very educated, and have raised the bar and encouraged us as an industry to reduce payloads and implement other steps to reduce pilot workload. This makes a pilot’s job easier, which can improve an operation’s overall safety. The goal is to educate everyone so they are playing on the same field. Bob Spracklin (BS): I am an odd duck in terms of my aviation career. Half of it has been on the operator side, the other half on the client side. Fire operations in Canada are one of the most complex for helicopters, with hazards we can never eliminate, you can only mitigate. We have the same attitude towards safety as operators have. We need to evolve safety and the best way to do this is to unite clients and operators to get some consistency of operational procedures. The fact HAC promotes and brings people together, it means that the conversation isn’t just a conversation, it’s a practical application. the maintenance staff – it is all of our jobs to make safety the No. 1 priority. Peter Barratt (PB): We started operations just under 25 years ago and safety was not a significant focus. The thought process was “do as I say, not as I do.” When Transport Canada (TC) said, “SMS is coming,” we thought, here is a tool we can use. Doug Strachan, our chief pilot at the time, developed our SMS, and because of that, we started training everyone along this premise. It worked to a certain extent. Then, we developed Best Practices. Now, we are evaluating the role personalities play on safety. We analyze personalities and traits, and have worked this data into our SMS to see what positives each personality type can bring – and also what negatives. Sylvain Seguin (SS): Safety is a complex issue, but to make it work effectively, you have to simplify it. When you have a number of bases, staff and aircraft, different types of work and missions, it is not easy. We look at lessons learned and try to come up with processes that work and are effective – and integrate these processes into our training and into the way things are done in the field. Over time, these elements become part of the safety management process. It’s also lessons learned from industry. 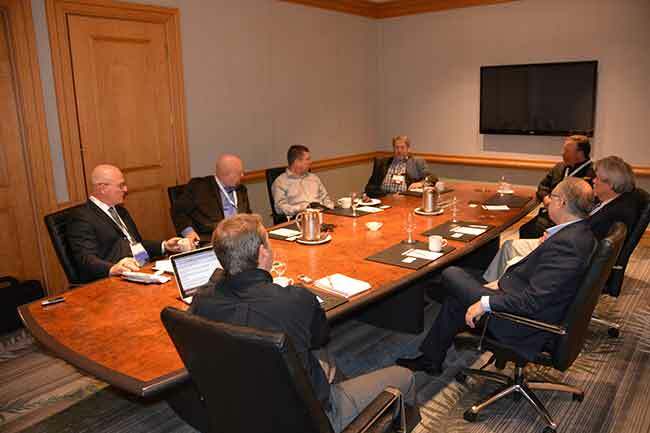 The more we can share our Best Practices – with HAC, with various committees, with industry – I believe this is where we can get to the next level; a sharing of industry information. Helicopters: Excellent points. I think part of the problem is – and Corey nailed it – there is often a disconnect at some operations between the corporate safety message and what is actually needed to get the job done. Comments? Helicopters: That seems like a rather draconian perspective. Is this still something operators deal with in the current operating environment? BF: It used to be rather “normal” to be pressured to the limits, but customers are getting wiser. They are integrating safety programs into their corporate procedures; some are paying attention and will work with you towards a common safety goal. But there are others that are definitely old school that will do anything to get the job done. I think the aggressiveness is starting to dissipate with some of this behaviour, which is obviously positive for the industry. Helicopters: So what is driving this change in perspective? BS: Clients and operators are starting to move in the same direction. You are getting philosophical shifts in perspective at some companies; clients are realizing the importance of having an SMS. Corey mentioned one of the challenges in creating a comprehensive safety culture: you have varying levels of buy in to the process at each operation. Plus, we have the challenges of differing levels of experience – educating at all levels, both with the client and operator. There is also tremendous turnover, so every five years you have to train new people. FJ: One of the things I see operators struggling with – and it becomes particularly problematic with high turnover – is information management. You are getting voluntary reports, incidents – how do you keep up with the information? And when you are hiring contractors who come to the situation cold and are faced with your specific system – how do you do it? A safety culture is based on an accumulated history of the corporate experience, the front-line experience and more. Digesting all of this information is certainly a challenge. SS: It’s a great point, which is why we need to find a way to simplify safety information. Operators need to find ways to work effectively with HAC – revisit your Best Practices and revisit your SOPs. If we want to share as an industry, I think the best venue is through these committees. We have evolved with our various committees at HAC and with Best Practices, the next step is with SOPs. BS: We have to look at safety at our operations and find ways to simplify it yes, but bear in mind, it is anything but simple. It is complicated and very complex. We can’t simplify it as a whole, but we can simplify what we do in bite-sized pieces. And if you have corporate types who think because you implement a few procedures that you’re done. That’s not going to cut it – there will always be more, and this kind of attitude may create a problem. Creating a complex system and breaking it out into bite-sized pieces is the best way to do it. But bear in mind, the whole thing, is very complicated. Helicopters: What about the role of the regulator? There are concerns with Transport Canada (TC) regarding service levels and a general lack of understanding of the helicopter community. How has this affected the safety environment? FJ: TC is well intentioned, but sometimes it is misguided, because overall, there is a lack of understanding of our industry. It is a complicated business. There are so many niche markets and niche operations that the regulatory body fails to understand. This, of course, applies to flight and duty times, but it also applies to a number of other areas. TC does not necessarily understand the importance of flexibility in our operational environment, something our operators and pilots understand intuitively. Seasonal operations, long day light hours in the north, the logistics of moving crews around – these are challenges that are completely foreign in an airline environment. There’s also the disconnect that exist because the things that drive the regulations from the government point of view are entirely different than the things that drive changes from the inside of an operation. For example, one accident could cause a huge change in motivation for TC to change part of the regulation simply because of its profile – and we have seen that happen for multiple situations over the years. 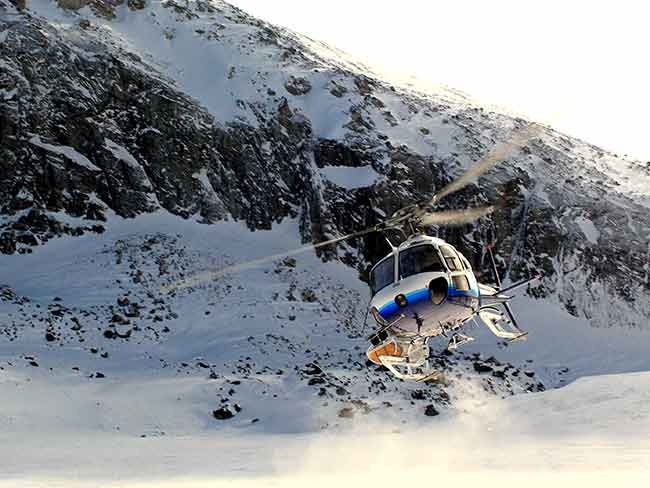 Helicopters: How does this disconnect impact safety at your individual operations and on the industry as a whole? BF: It definitely has an effect on safety. And TC is almost unresponsive on very basic service levels. One colleague said she has had files on her desk for over 12 months. The level of service from TC? There is really nothing there. And it is not the individual inspector’s fault. They are overwhelmed and underfunded, so they are spread so thin that they can’t deal with a lot of things. PB: It’s bureaucracy as we all know. Some 25 years ago, I remember TC had a mandate that said, “we are here to help.” Well, now it is simply, “we have no money and we can’t help.” So, it drags on. But that isn’t the worst aspect of it. Try dealing with the security side. It took us a year-and-a-half on one project just to get a clearance. You get a different person on the phone every second day. CT: When I started in the industry, I was impressed because TC inspectors always had such a great background. Their experience was impressive – they always knew where I had been, what I had experienced. It still exists to a certain degree today, as there are some that have this background, but others you look at and just shake your head. They have no understanding. They have never done it, they have never been involved in the industry, they have heard about it, but they certainly have strong opinions about it. JF:To me, it comes down to leadership. As leaders in our companies, it is our responsibility to make sure we put the proper resources in place for tools and training. The government has failed to do this for the past decade or so. Helicopters: Bob brought up an interesting point about simplification and concentrating on “bite-sized” pieces in developing a stronger safety culture. Any examples? CT: This really resonated with me, because there are some strategies we are supposed to implement throughout the industry and I have never seen them done successfully. For example, external load tracking equipment. You get an onboard hook that is good for five years or so many hours, but nowhere I have worked – and forgive me if the other operators here are good at tracking this stuff – has this information been tracked well. Usually a client says, “So how many hours have you had on that hook? When is it due for an overhaul?” And we say, “Sorry, what?” And then you find out, you don’t even know where you got this hook and you can’t find any information on it. One of things that we have done as a company, because we run paperless on the flight ticket side, is we are trying to simplify it and make it easy for the pilots to comply and do what they are supposed to do. This is where technology comes in, because now if you fill out a flight ticket, it is not paper, it’s a tablet and it’s a forced response. Have you been doing an external load? Drop down box, click yes. Were you using a long line? Click yes. Which long line? Drop down box select and you are done. It selects your hook, tracks it all, and if you are using it more than one day, you can just indicate “no changes” and go from there. It tracks all of the data. This kind of information is invaluable and it is not that complicated to implement. PB: What we have found with SMS, is it led to a whole range of things we weren’t aware of, or we didn’t know we weren’t aware of. And we ended up updating our policy manual, building a Best Practices manual, identifying personality profiling. The fact is, everyone has positives and negatives and not everyone will do what you want them to. Yes, safety is complicated, but you have to find the right tools to keep it going. And we have gone a little bit further with it – such as instituting personnel profiling – and we involve the clients in some of our safety meetings and we compare notes. Any problem can be solved through communication, so we are trying to communicate. Helicopters: So, are we doing enough individually – and collectively – as an industry to be as safe as we can be? CT: I don’t think so, but I do think we want to. People are busy. One of the problems we have as an industry is we are in a big downturn. And if you believe that safety has no cost, that is nonsense. Many of the compliance issues when you get into the quality side of things, you just need more people. I think operators really want to find a solution, but often, it isn’t easy. We are making progress, but are we doing enough? No, but you can’t just ramp up and do more immediately. At the safety forum, many operators came up to me that I would have thought were not safety savvy at all – smaller markets, not sophisticated, smaller geographic areas. But I was amazed at how advanced some of them were – especially in attitude. BF: I agree that the industry is on a steady improvement. How to speed up the progress or fix it per se, I don’t know how to do that, but if you look at where we came from and where we are, there has definitely been progress. We had over a 12-month period with zero fatal accidents – that is unheard of in our history. To me, the industry should give itself a pat on the back. We have never had this in the past, we have hit a remarkable target, but how do we reach a higher level? It’s definitely tough. JF: We have come a long way as an industry, even in the last five years. It will simply require more commitment, more work. We have to keep our heads down and keep at it – piece by piece. SS: If you look at the last five or 10 years, there has been a complete change in the standards and expectations of clients in various industries and this is progressing all the time. There also has been a distinct safety movement within various organizations. Safety does have a cost – and when you have customers that ask for a 15 to 20 per cent reduction in pricing, it’s harder to make massive investments in safety infrastructure. We have to be creative, we have to find ways to share information, create Best Practices and come up with the same result but for less. It is also about sharing of information, because some of the issues that we all have, whether it is Yellowhead or Great Slave, or Valley, they are very similar issues. We need to create data gathering processes that can be shared with industry – that could be the next phase in our safety development. Helicopters: Fred, on the 20th Anniversary of HAC, and through your commitment to the industry, you have earned the last word. FJ: The challenge from the Association’s point of view is to try to bring some structure that can be shared. How do we take a system that represents the Best Practice and export it to all of the operators, small ones, large ones – but how do you do that? Best Practices are a good start but we are struggling at the Association to determine what is the next step. We need to find a way to operationalize the systems, the changes, the policies, the SMS, the Best Practices, and export it in a form that is digestible and can be used by individual operators. The Association has got to evolve as well. Technology will be part of the answer, but it is also, for the Association, identifying systems that will be most useful industry wide. Helicopters: Technology is key to achieving a higher safety culture, but how many of the transformative ideas come from other industries? FJ: I think this is definitely part of the answer – looking to other industries for tools, ideas, mechanisms and technology to push the information out. It can only work to enhance and develop a brand new level of safety across the industry.